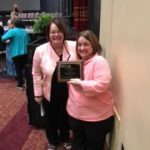 home Cycle of Success Congratulations to Michaelle Dorsey for her Chancellor’s Outstanding Staff Award! 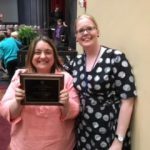 Congratulations to Michaelle Dorsey for her Chancellor’s Outstanding Staff Award! Once a year during Staff Recognition Week, the Chancellor’s Outstanding Staff Award is given to one person in each of four job categories. The award “represents those who best reflect honor upon the University and the community through a combination of job performance, job-related personal qualities, relationship with their associates, and the ability to relate their work to the missions and values of the University.” Considering the number of employees currently employed at MU, this is a great honor. 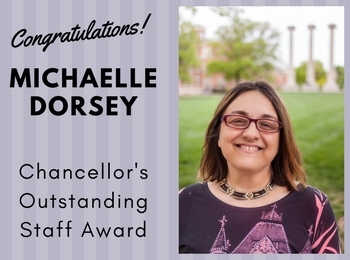 Ellis Library is lucky enough to have an amazing staff member who won the Chancellor’s Outstanding Staff Award this year, Michaelle Dorsey, head of our physical processing/preservation unit. Tell us a little about your background and experience? I have a BFA in painting and a BA in English Literature from Truman State University. In May 2017, I earned my Master of Arts Degree in Information Science and Learning Technologies with an emphasis in Library Science (what a mouthful!). While at Truman State University, I was a student assistant in the physical processing unit at Pickler Library. I started at Ellis Library in 1994. What’s the most arduous task you have? Hands down, the most arduous task is disaster recovery. Disaster recovery is mentally and physically exhausting. In addition, for library staff, damage to the physical collection and the building elicit strong emotions that last well into the recovery process. During the 2011 fire, it was difficult to work against the clock, directing the salvage of physical library materials, finding resources needed to continue the effort, acting as mediator between areas with different priorities while dealing with the emotional and psychological ramifications of the vandalism. After the initial recovery effort, library routine goes back to normal but recovery of damaged library materials is an ongoing process for Technical Services staff long after the initial event. Is there any task you enjoy doing personally, rather than delegating? There are many parts of my job that I enjoy. However, I’m happiest when performing preservation and conservation treatment. As my responsibilities as a manger grow, I have less time to personally repair library materials. This is sometimes hard for me to reconcile. I derive great satisfaction from working with my hands, knowing that through my efforts, library resources continue to be available for scholars, students, and researchers. However, I remind myself that the more skills I pass along to those I supervise, the more impact we can have on the state of the MU Libraries Collection. Now that you’ve completed your Master’s degree, what are you working on? The MU School of Information Science and Learning Technologies doesn’t offer a conservation component so I focused on digital preservation and digital libraries. I’m currently apprenticing with James Downey, a local conservator. Mr. Downey and I are working with MU Special Collections to identify RARE items in our collection that need conservation treatment. The plan is for me to begin performing conservation treatment in-house. You currently work on preservation, but are still learning conservation. What is the difference between the two? Preservation treatment and conservation treatment require similar hand skills but the decision-making, purpose, and philosophy differ. Preservation prolongs the life of library materials in the general collection, allowing them to remain viable to the user with the idea that they are not currently rare and can be replaced or are owned by a large number of other institutions. Conservation is performed to prolong the life of the item for a benchmark of 300 years (as long as it is kept in the proper environment) with an eye towards retaining the content and the historical significance of the physical object, and as much of the original materials and structure as possible. The idea is to do only as much as is necessary to keep the material stable using materials and processes that will not increase deterioration and are reversible if needed. Michaelle with librarian Corrie Hutchinson. 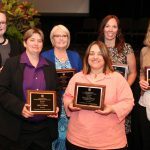 Chancellor’s Outstanding Staff Award winners! Ann Campion Riley, Vice Provost and University Librarian, with Michaelle Dorsey.